Hualien is a moderately interesting city, with a several historic sights, mostly from the Japanese era but also a couple of aboriginal sites thousands of years old. Unfortunately they're mostly spread out over several kilometres, so unless you're a true aficionado of Asian or indigenous history you'd probably be better off doing what 99.99% of foreign visitors to Hualien do, and using your time - and your wheels if you have them - at Taroko Gorge. I do hope to visit the other sites in the future, but for now I'll focus on two sights which are within easy reach of Hualien City. Japanese might notice that the temple is not quite so authentic as first meets the eye; in particular as essentially a museum piece it's not maintained and presented nearly as immaculately as those of 'real' temples in Japan, wherein the monks spend many hours carefully grooming the gardens and grounds, and keep everything spotless. Nonetheless the temple is a lovely 'little piece of Japan' in Hualien, and a fun place to watch hundreds of Taiwanese come to practice Japanese rituals. Chi'An Ching Hsou Temple (吉安慶修院, also Qing Xiou Temple or Ji'an Keishin) is Japanese Buddhist temple founded in 1917, at which time Japanese were encouraged to migrate to Taiwan, particularly to this region (Chi'an was then called Yoshino, which uses the same characters) to develop the region's horticultural industry. The temple was then known as Shingon Yoshino Dojo. The temple belongs to the Shingon Esoteric sect of Buddhism, which was founded by Kobo Daishi (known posthumously as Kukei), who travelled to China to study Buddhism, and thus his philosophy is closer to Mahayana Buddhism, which is practised in China, Korea and Taiwan, than other schools in Japan; in particular it is the only one which encourages vegetarianism. Many visitors to Japan stay at Koyasan (Mt Koya), the school's centre for more then a millennium, to enjoy exploring the temples, the attached equally old graveyard, hiking in the mountains and eating shojin-ryori (Japanese vegetarian temple cuisine). Like so many beautiful historic Japanese buildings in Taiwan, the Chi'an Temple suffered from neglect and abandonment following the departure of the Japanese after their defeat in WWII and the subsequent Chinese takeover. It was finally recognised as an important historical site in 1997, restored, and opened to the public in 2003. Tourists line up to perform the purification ritual before entering the temple. Chi'an township is about five kilometres from Hualien City, so about an hour's walk from the train station. All walks being relative, it's fairly pleasant interesting one, with footpaths most of the way, and for the last couple of kilometres it follows a small river through farmland. If you're coming to Hualien on a local train it's worth continuing onto Chi'an station (one stop south) but it's not worth taking a separate train from Hualien, as they are infrequent and it's still 2km from the station. It would be an easy bicycle or scooter ride, or should take about 15 minutes in a taxi (200-300 NT). The route from the train station passes by the Loving Hut. The Gang Tian Temple (港天宫, also Gong Tian Temple) is the largest temple in Hualien. It's dedicated to the goddess Matsu, who was born in China in 960AD and is worshipped in China, Taiwan and Southeast Asia. She is believed to roam the seas protecting sailors and fisherman. The temple also has statues of other popular Buddhist and Taoist deities, and its intricately decorated interior is not unlike other Taiwanese temples, however what stands out about Gang Tian Temple is its size, being several stories high with smaller attached temples. I'm usually reluctant to photograph inside active sites of worship, but the staff member on duty when I visited was happy to introduce me to the gods on display and encouraged me to photograph them, seeming almost offended that I wouldn't. I even left with a sesame biscuit, which I'm promised will bring me good health as it's has been offered to the gods. I was just pleasantly surprised to find it was vegan. If you do wander inside and take photographs it's polite to make a small contribution to the temple (100NT fine), especially if someone has given you a tour. It's about a 3km or 40 minute walk from the train station, or a short, cheap taxi ride. If coming directly from the train station take the rear exit. 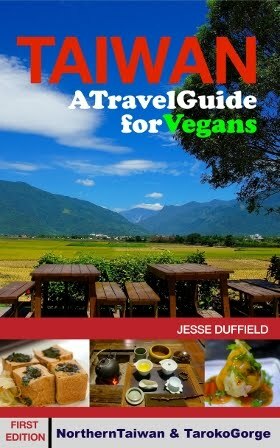 The route passes by the two vegetarian buffet restaurants, both close to the train station. Don't arrive in Hualien late and hungry as this little decent food available after about 19:00. I recommend the Loving Hut. It's about two kilometres from Hualien Station, so a twenty minute walk or a short taxi ride. Besides being a simple, delicious cafe, the Loving Hut is the perfect place to load up with sandwiches and other take-out meals for Taroko Gorge. Take these with you to Taroko Gorge. 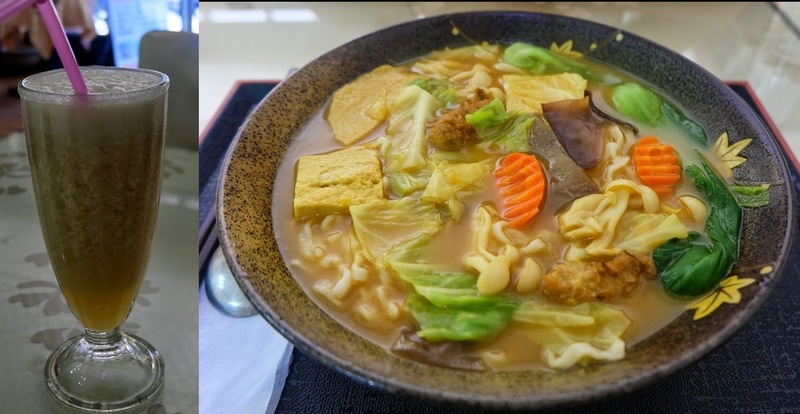 Another good option for Hualien is the all-you-can-eat Chang Chun Vegetarian buffet restaurant, which is excellent value at NT200 per person. Closed: second and fourth Monday of each month. Due to the ever-growing influx of tourists visiting to see the gorge, the hotel situation in Hualien isn't good, with a decent and bathroom bed difficult to find for under NT1000. There are a few hostels, of varying quality, which can be found online, and several hotels scattered around the train station, but you may be lucky to find clean sheets on many of them. I highly recommend staying at City Home. At 2000NT per night (weeknights) it's moderately expensive for Taiwan, however its spotless, spacious, tastefully decorated rooms, combined with a simple but delicious breakfast the next morning make it well worth considering the price. It sells itself as a 'hostel' but it's more like a boutique hotel. If you will have just one luxury night in Taiwan consider making it at City Home. They also have larger rooms with more beds for families or travelling groups. As of April 2015 prices are exactly the same if booked directly (website is in Chinese) or through Agoda. A breakfast menu is provided at check-in, and a simple, traditional, delicious Taiwanese-style breakfast is served in the rooms the next morning. Prices at City Home double in the weekend, as is standard for Hualien. So it's important to book ahead for a weekday, which brings the added benefit of seats on trains and fewer visitors to Taroko Gorge (or almost anywhere else you're going). Unfortunately City Home is about 2km from the train station, so it requires a taxi if carrying luggage (address for taxi:花蓮縣花蓮市大同街30號). If you want to stay nearer the train station I recommend the Green Hotel (also Fu Yeh hotel), at 1300NT for a double room (on a weeknight - don't come to Hualien during a weekend). The room was small but clean, very much like a business hotel from Japan, but of course older and less well maintained (but much better than most in its price bracket). If you must stay at a hotel in this price range, near the train station, I would recommend it. It makes it easy to reach the bus station (two minutes walk away) for an early bus. 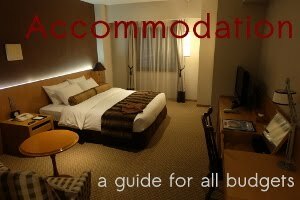 None of these suitable: Search for more hotels in Hualien on Agoda (about link). The best way to reach Hualien is by the Taroko Express. These Japanese trains tilt as they go around corners, reducing the travel time from Taipei to Hualien from three hours to two. And better still, they cost the same as the regular Tze-Chiang (express) at 440NT. These must be purchased in advance for busy times, such as evenings and weekends. Coming from anywhere it's best to just take the fastest train you can get a seat on. There are no direct buses from Taipei to Hualien. For more information see my post on intercity transport or comparison of train types in Taiwan. There is no underpass to the train station (what were they thinking?) and getting from one side to the other requires about a ten minute walk or the purchase of a cheap, but inconvenient "platform ticket", so it's best to know which exit to take first. The lockers, tourist information centre and bus station are all outside the front entrance, but most restaurants and most sights are closer to the rear exit. Much of Hualien actually has footpaths (not so common in Taiwan) so walking is possible, especially when it's not too hot (or cold). Hualien has a very limited bus system, so it's rare to be able to get one where you want to go. Taxis start at 100NT, and a taxi ride within the city should be under 200NT. Several scooter stores rent scooters to foreigners with local or international licenses. If you don't have one, are confident riding a scooter and are willing to take the risks of an accident (your health insurance probably won't cover you and possibly being liable, regardless of who was at fault) it may be possible to find a store willing to rent to foreign tourists without licenses, so ask a few stores around Hualien. Licensed or not, if you choose this route please be extremely careful, especially if riding to and around Taroko Gorge, as roads are narrow, can be slippery and are plied by far more tour buses than the roads were built for. Many bicycle stores and hotels also rent bicycles, but if you borrow one ensure that it has a very good lock (or buy your own) and use it. The Visitor's Centre is to the right of the trains station as you come out the main exit. They provide a free map and brochure on Hualien and Taroko Gorge, but for more up-to-date information of Taroko Gorge, or to purchase a book on hikes in the gorge one must visit the Taroko Gorge Visitor's Centre. The bus station (for Taroko Gorge) is to the left of the station. Taroko Gorge - of course. Stay a night or two in Tianxiang (inside the gorge). Search for hotels and hostels in Hualien on Agoda (about link). Is something out of date? Please let me know. Copyright Formosa Guide (2014-15). Simple theme. Theme images by gaffera. Powered by Blogger.